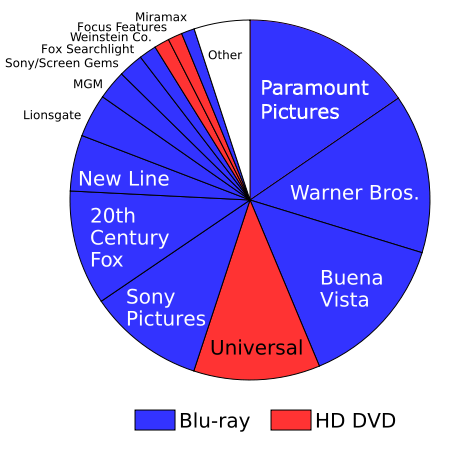 Paramount Pictures is poised to drop its support of HD DVD in favor of Sonys Blu-ray format, landing a decisive blow to the Toshiba-backed next-generation DVD format and all but assuring Blu-ray's role as the future standard for all high-definition digital video discs. The news, which comes by way of the Financial Times, arrives just days after Warner Bros. said it would switch to releasing high-definition movies only in the Blu-ray disc format, abandoning a neutral strategy that saw it's catalog available for both HD DVD and Blu-ray next-generation DVD players. The move will leave Universal as the lone major Hollywood studio backing the HD DVD format and presumably conclude a multi-year battle for supremacy in the home entertainment market, leaving HD DVD to suffer the same fate as Sonys now obsolete Betamax video technology when it lost out to VHS in a similar format war back in the 1980s. As noted by the FT, Paramount and DreamWorks Animation —makers of the Shrek series of films — came out in support of HD DVD last summer, joining General Electrics Universal Studios as the main backers of the format. However, Paramount is understood to have a clause in its contract with the HD DVD camp that would allow it to switch sides in the event of Warner Bros. backing Blu-ray, the financial paper said, citing people familiar with the situation. It's reportedly unclear whether DreamWorks has the same get-out clause in its contract with the HD DVD camp, but the animation studio maintains a close relationship with Paramount as the distributor of its films on disc. For its part, Universal has remained mum on its forward looking plans for high-definition video discs and has declined to comment on the situation since Warner Bros. announced its intention to drop HD DVD support last Friday. Update: According to Bloomberg, Paramount has denied the report by the Financial Times. "Paramount's current plan is to continue to support the HD DVD format,'' Brenda Ciccone, a spokeswoman for Paramount, said in an e-mail. Meanwhile, Keisuke Ohmori, a spokesman for Tokyo-based Toshiba, called the Financial Times' report "speculative."